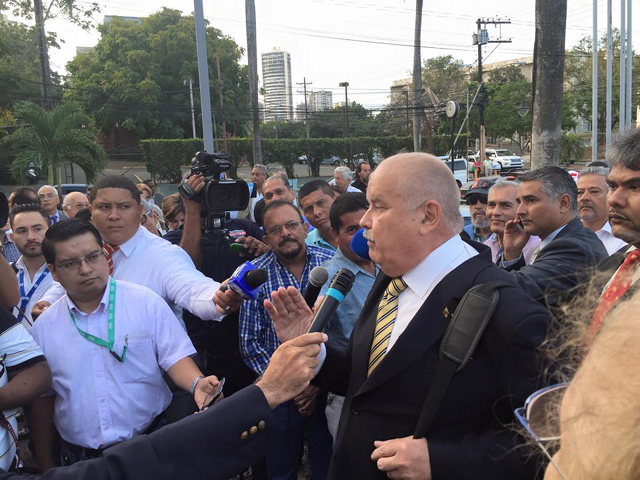 Dr. Bernal and his supporters, when the corrupt “Rector Magnifico” tried to kick him out of his teaching position at the University of Panama law school. Archive photo by José F. Ponce. by Miguel Antonio Bernal V.
Since the military dictatorship’s sinking, Panama has lived in a prolonged crisis of values. This keeps us from determining which are the most important values that we should institutionalize. On the bottom line, what happens to us is that we have been blocked — by different mechanisms — from institutionalizing political freedom. We are taking about the need to institute a real, effective and transparent political freedom that eliminates the endless quantity of obstacles that exist in our midst which impede citizens from acting according to their responsible will. We should consolidate the steps, mechanisms and procedures favorable to political freedoms. We are called today more than ever to emancipate ourselves from misery, the tyranny of structural poverty, of inequality, of ignorance. We cannot allow these to continue reducing the roles of public institutions and public services to the defense and protection of the privileged ones and their privileges. In the coming days and months the crisis of values will no doubt become more accentuated, and this will increase the peril to our political liberties. We ought to renounce the role of financial shelter and rescue our trampled national dignity.